← Should I Walk My Dog Every Day? 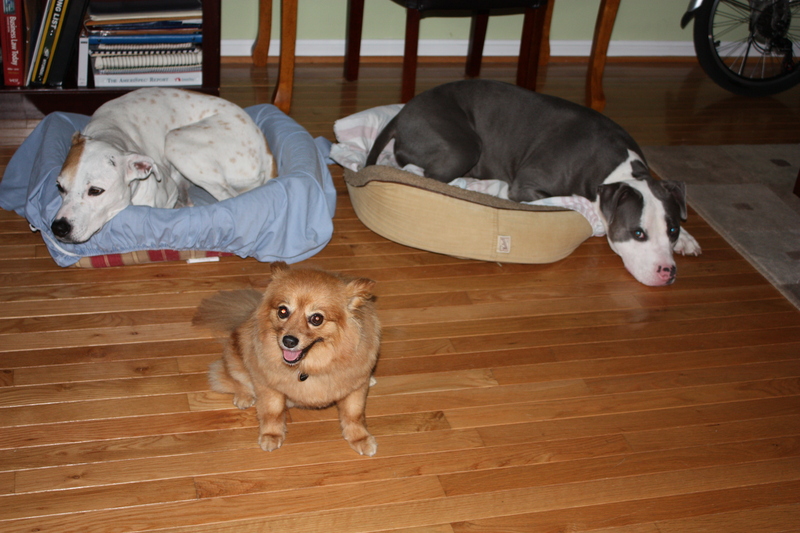 My Canine Entourage: Alex, Kingston, and Roxy. I always thought that an entourage, as defined by Webster’s New World College Dictionary as a group of accompanying attendants or associates, was only for movie stars, athletes, singers, etc., but I was recently proven wrong by my canine companions. Roxy, a beautiful Pomeranian, stayed with us this weekend and out of all the dogs I have had the opportunity to share my home with she is my most faithful follower. She even wants to go and make me company while I go to the bathroom. No, she does not stay with me in the bathroom. I don’t see the point of torturing such a wonderful creature. When is time for her to go home, she is usually tired because of our walks, but also because if I am doing chores at home she is right next to me going up and down the stairs. Anyway, this weekend was hectic, but enjoyable and as I was going around the house doing chores, my entourage, Alex, Kingston and Roxy, was quite a sight to see. As soon as I moved to go anywhere, Roxy was the first one to move and get close to me, followed by Kingston, and then Alex. They are all so beautiful, different, and amazing in their own particular way. Watching them go up the stairs was amusing and entertaining to say the least. Roxy, maybe weighing 10lbs., is very agile and fast. Kingston, about 70lbs., is massive and no way as fast as Roxy. Alex, about 45lbs., is slow when she chooses to be slow and this weekend she decided to be pretty slow. I thought to myself, “Wow! What an amazing entourage I have. Talk about being lucky”. This entry was posted in Dogs, Humor and tagged Dog, Pomeranian, share my home. Bookmark the permalink.